Scarperia, located approximately twenty five kilometers north of Florence, is one of the most remarkable towns in the Mugello area. The town appeared in the XIV century close to San Barnaba Fortress, Castel di San Barnaba. Florence erected the military enforcement to resist the power of the Ubaldini feudal lords. In no time the fortress became the most important one in the Mugello; and Florence honored it with its coat of arms. However, the history has preserved the old name of the town, Scarperia. The historic center of Scarperia was surrounded by rectangular defensive walls with square towers. The walls were partly destructed while time flew, though some fragments have been preserved perfectly. A number of social and cultural buildings are located in the center on the ancient settlement. The Vicar Palace, Palazzo dei Vicari, is located on the central square. The Church of St. Philip and St. Jakob, Parrocchia Santi Jacopo e Filippo, towers above opposite to the palace. Its façade is decorated with lots of coats of arms which belonged to Florentine vicars. Trimming materials and frescoes of the Renaissance period make a sharp contrast to the plain exterior of the building. Oratorio della Madonna di Piazza Chapel is located on the square. It’s the place where the vicars vowed to be faithful to the Florentine Republic. Among sacred buildings of Scarperia, it’s worth mentioning the outstanding parish church of St. Agata, Pieve di S. Agata, erected on the base of a Roman church. It is located three kilometers of the center, on the territory of the village which belonged to the Scarperia commune. The outskirts of the town have kept many more remarkable secrets to explore. Since the Middle Ages, Scarperia has been known for production of cutting instruments. Local craftsmen used to forge excellent arms as well as good agricultural instruments. To get acquainted with local craft traditions, you should visit the famous museum of cutting instrument, Museo dei Ferri Taglienti, located in the Vicar Palace. New theme exhibitions are held here every summer. Ancient traditions are still alive. Four shops specializing in sales of metal items are located in Scarperia. 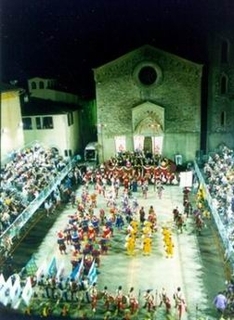 A lot of cultural events take place in Scarperia during the year. The most known ones among them are held at the end of spring and at the beginning of autumn. Thus at the end of May, while the «Infiorata» festival, the roads of Scarperia are covered with pictures of flowers. The medieval festival is held at the beginning of September. Historic reconstruction called Diotto is considered its key event. Sporting fans will gladly find out that a golf course for 18 holes is located close to Scarperia. It is owned by Poggio dei Medici Golf Club. The International Mugello Circuit is also located on the hilly Scarperia outskirts. Test drives of Formula-1 as well as various auto- and moto races are held here. Water recreation lovers should definitely visit the artificial lake of Bilancino located north of Scarperia. You can take up windsurfing or canoe boat racing here. A vacation in Scarperia is a chance to feel the charm of the tiny Tuscan town and have interesting cultural and active recreation at the same time. A small town of Scarperia becomes much more livable in September. Starting with the first Sunday of September, a number of events take place here. Held on September, 8, Diotto is the main one among them. The small Tuscan town of Scarperia literally busts into blossom on the last Sunday of May. The flower festival named Infiorata is held here for one day from ten o’clock in the morning till ten o’clock at night. Streets and squares of the center of the town are covered with flower pictures. Flower beds are made from petals, buds and leaves. Mostly they are carnations. The day before it, town volunteers, students, and traders patiently collect them preparing “colors” for prospective masterpieces.